Corynebacterium pseudotuberculosis are gram-positive intracellular bacteria with worldwide distribution, however, cases are most common in western United States. There are 3 forms: External abscesses are the most common (91%), followed by internal abscesses (8%) and ulcerative lymphangitis. C. pseudotuberculosis is commonly known as "Pigeon Fever", which comes from the external abscesses located in the pectoral region, seen in the picture below. The bacteria are transmitted through horse-to-horse contact, via insects, other vectors, and contaminated soil. Horses housed outdoors and with other horses areat higher risk of infection. The most common clinical signs include edema in the area of the abscess, hard and painful swellings and fevers as high as 104F. There are many diagnostics available however due to the nature of the infection; treatments are often based on a combination of the history, clinical sings, local prevalence, time of year, and laboratory tests. Treatment of C. pseudotuberculosis consists of establishing abscess drainage, sometimes long term antibiotic therapy, physical therapy, hydrotherapy, hand walking and anti-inflammatories (NSAIDs). The overall prognosis for a C. pseudotuberculosis infection is good; however, infections with internal abscessation have a higher mortality rate (30-40%). 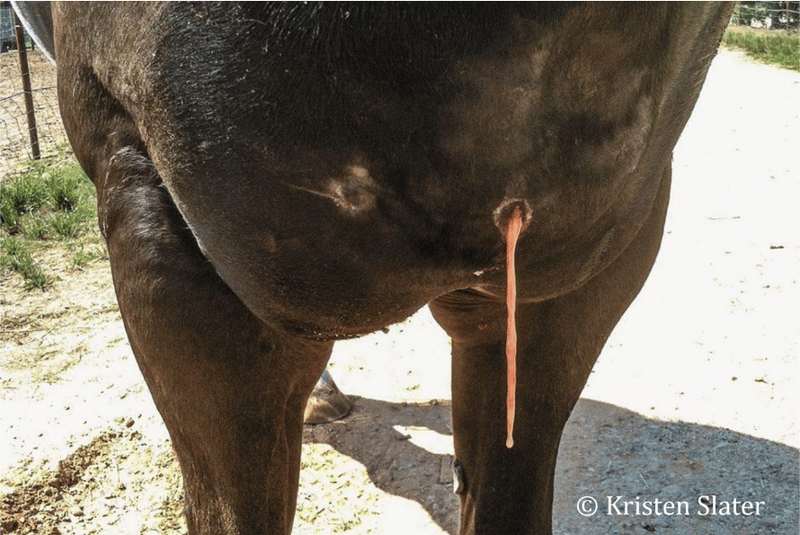 Once external abscess drainage has been established, signs typically resolve in 10-14 days and most animals have a complete recovery. Because these organisms are common in the horse’s environment, prevention can be challenging. Fly control and general sanitation are the best ways to help control and prevent C. pseudotuberculosis infections.